Further to our update last week on the Property Market. 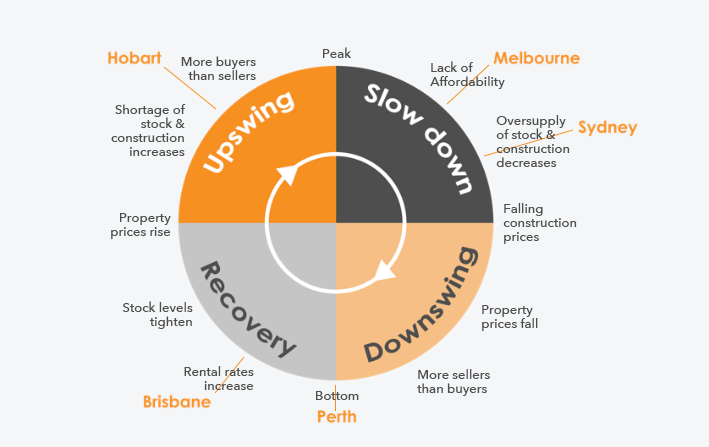 The reality is, there are a vast number of different property markets within Australia, and hundreds of different sub-sections within these, all of which are at different points in their property cycle. Take Perth and Brisbane for example. 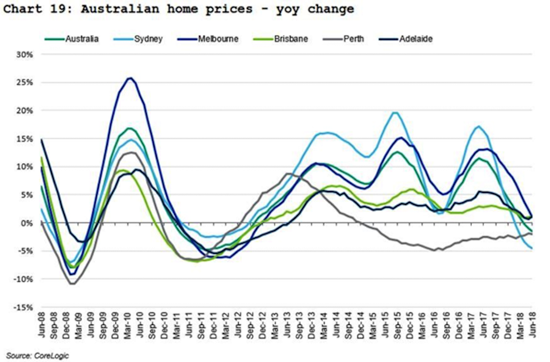 These residential markets are near the bottom or showing initial signs of recovery – a far cry away from the current situation in Sydney and Melbourne. Even our own government and government agencies are guilty of this generalisation in their policies that affect the property market. You only need to look at recent lending regulations (and APRA changes in particular) to know this national outlook doesn’t work. The next policy with national impact is negative gearing. When are we going to realise this and move away from the blanket approach? This publication has been prepared by AustAsia Group including AustAsia Real Estate Pty Ltd (REBA Licence No. RA1736), AustAsia Financial Planning Pty Ltd (AFSL License No 229454) and AustAsia Finance Brokers Pty Ltd (Australian Credit Licence No 385068). Information in this publication is accurate as at the date of writing, 22 March 2019. Some of the information may have been provided to us by third parties. Whilst it is believed the information is accurate and reliable, the accuracy of that information is not guaranteed in any way. Landlord’s Insurance helps to provide you with peace of mind that your investment property will be covered should the unexpected happen. You can cover your leased or rented property including flats, units, apartments and houses. We recommend that all residential investment property owners should consider putting a ‘safety net’ policy in place to protect their investment. As a general rule, Landlord’s Insurance premiums are usually tax deductible. If all goes well, the value of Landlord’s Insurance may not be fully appreciated, but when things go in the opposite direction and “turn sour”, having a Landlord’s Insurance Policy in place turns out to be a very wise decision. The majority of tenants appreciate and respect the property they rent. However, it is important to have a strategy in place for unexpected damage to the property or when the loss of rental income occurs. Rent default and associated legal costs. Theft or attempted theft, by a tenant, their guest or someone else. Vandalism, or a malicious or intentional act, by a tenant, their guest or someone else. Burn out of electric motors – fusion. Storms, Water and/or oil leaks. Broken glass – buildings and/or contents. *Subject to the insurer’s various conditions, Claim Limits and Excesses per event. Landlord’s Insurance can help the owner in situations where a tenant leaves the property during the term of the lease without telling the Landlord or managing agent. Due to non-payment of rent the managing agent and/or the Landlord may need to attend the Court so that the Owner can obtain vacant possession of the property. This process can be quite long, sometimes up to 8 weeks. During this time no rent is paid by the tenant. Too often the evicted tenant leaves a lot of damage to the property that needs to be fixed and rubbish that needs to be removed. Another week or two may be required to enable the property to be re-let. During this time, the Landlord obtains no rent and may have large expenses. Some of these extra costs can be reduced if you have Landlord’s Insurance. It’s important to investigate the details, the optional extra covers available from the different insurers in the market and the resultant cost of the premiums before you buy a Landlord’s Insurance policy. AustAsia Real Estate does not sell this type of insurance however it is readily available from most insurance companies. if you would like some more information on this or any other real estate matter. This publication has been prepared by AustAsia Group including AustAsia Real Estate Pty Ltd (REBA Licence No. RA1736) and AustAsia Accounting Services Pty Ltd (Registered Tax Agent No 7587 3005). There are a lot of clients who have asked us for advice in relation to the property market. To assist clients, we give some clarity to the media reports and other information relating to the property market, and particularly in WA. We have been asked by numerous clients on whether they should hold their property or sell, or should they buy another property? Based on our research, knowledge of the market, and a variety of economic factors, we are of the view that the property market in WA is likely to improve over the next 18 months to two years, with rental returns increasing, and demand for property also increasing. We have not taken into account the policy that has been announced by Labor, if they win the next election. This article goes into further detail on our views. Political factors, such as the recent announcements by Labor on capital gains and the ban on negative gearing. Australian Capital Territory (ACT) / Canberra. Refer to Appendix for further details. The economics in the mining and resource led states (WA and Queensland, parts of NSW and Northern Territory) are on the improve, with this driving a reduction in unemployment, particularly in WA and NT. The economies in NSW and Victoria were driven largely by an increase in capital infrastructure spending by those governments as they have improved roads, power and other essential services. The rest of the Australian economy is struggling, particularly with construction which has been dropping due to a limit of buyers. Banks have tightened lending policies in line with the Government regulation and international regulations on banking standards, which in turn has led to an increase in the requirements for banking customers to be able to obtain loans. The Reserve Bank has come out and stated in recent policy that its main concern is to keep inflation under control, and also stimulate employment. A number of economists, including ANZ, are of the view that there won’t be any rate rises in 2019 or 2020, as a way to assist the economy to cope with any softening, particularly in Sydney and Melbourne. Unfortunately for WA, the political agenda is generally set in the Eastern States of Australia. Despite WA providing the majority of exports in terms of dollar volumes (mainly due to Iron Ore and natural gas exports), WA still has to dance to the national tune. 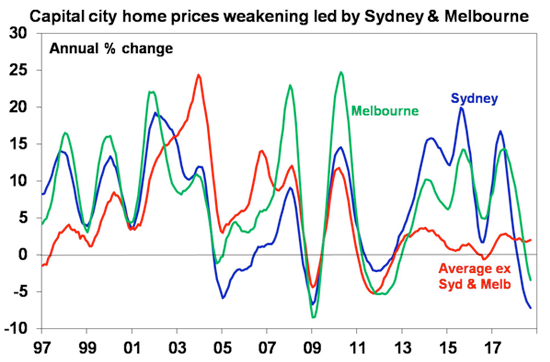 Time will tell if there is an effect on property prices from Labor’s policies if they win the election (as we highlighted in a previous newsletter), with a likely decline in national property prices. We are of the view that most people invest in property for the investment returns, and not just the tax benefits, as many of the politicians believe. But this could effect the property markets, which may mean that a recovery in the property market takes longer. New taxes on foreign buyers of property have also been introduced. Across the country, each State and Territory has passed law which effectively increases the stamp duty on properties to be between 5% and 8%, depending on the location of the property. This has a limiting effect on demand. A major issue which affects the economy, and particularly in WA, is population growth. As the population grows, the demand for housing, be it rental or property ownership, increases. There are already starting to be shortages in a number of trades and positions which relate to the mining and resource industries (not just mining and resource companies, but also the businesses which service those mining and resource companies). In the last mining boom in WA, there were a lot of fly in, fly out workers, who were travelling from other states of Australia, and even New Zealand. But, with a lot more economic growth in those places this time around, there isn’t a transient workforce available to assist the WA economy. After the WA 2017 election win by Labor, Mark McGowan moved to remove Perth from being a region for migration purposes. That has put a hold on growth, as businesses are unable to bring in a variety of trades and skilled workers that are needed to assist the likes of Rio Tinto, BHP, FMG, Roy Hill, Woodside, Chevron, and Santos, as well as all of the junior mining companies and gold miners. Unfortunately, this has forced a number of the larger companies to send engineering and drafting and design contracts overseas, as Australia does not have the capacity to undertake that work. Perth – Metronet – $4bn. We have conducted some analysis of the property market in Australia and breaking it down in particular for WA. The Sydney and Melbourne markets, as has been touted in the media, have dropped by up to 20% in some suburbs, and are likely to stay flat until the demand for property increases in those markets. Over the past 12 months, WA has gone from being the worst performer and having the softest property market, to now being ahead of the game. The WA property market was starting to see some improvement in late 2017, and then started to cool-off into the 2018 calendar year, as concerns were being raised on the economy. From January to March 2018, a lot of new investment and expansion for mining and resource companies was announced, and commencement being undertaken. 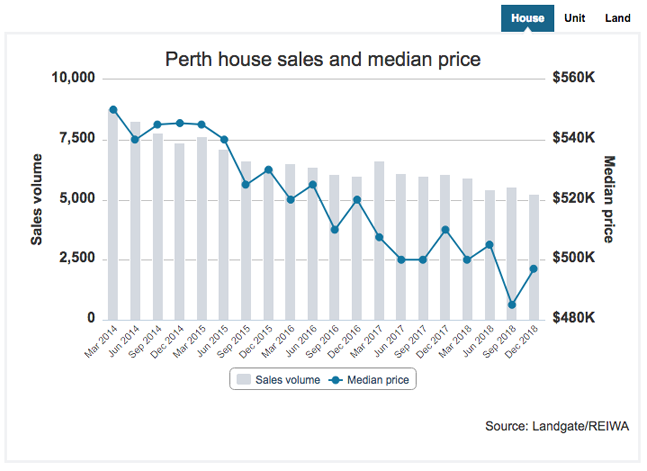 In our view, the WA property market has already seen the bottom – as our further analysis below shows – and is likely to improve over the next couple of years towards the end of this calendar year (2019) and into 2020. Rental demand has increased, with vacancies decreasing, and the rental rates have also started to increase. 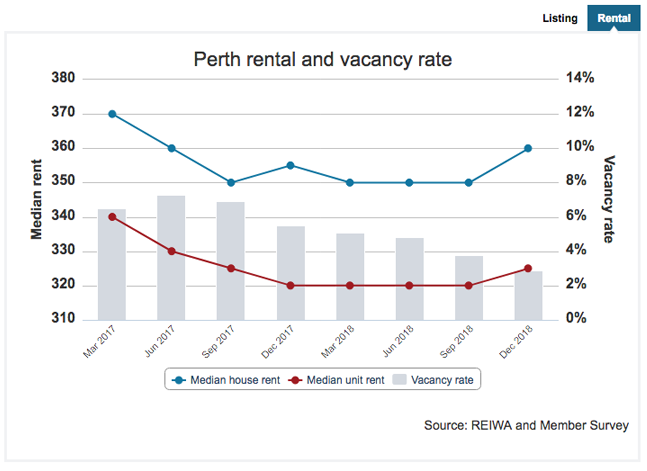 With an increase in rental returns, it is likely that the demand for property in WA will improve. 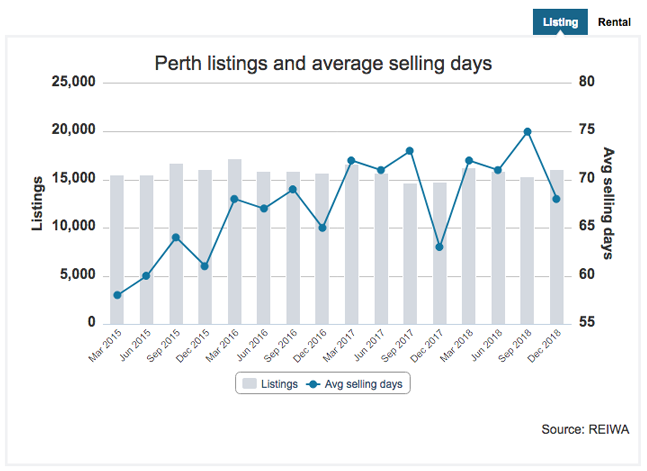 The number of days that a property has taken to sell is also on the decrease, with the number of listings (people wanting to sell) slightly increasing. Most sales of property, from around 2016 until more recently, have been as a result of forced sales of owners having to reduce their debt levels. This has started to decrease – as is shown – and is a sign of improving confidence within the property market. The property market over the last year has struggled with a decrease in the number of sales, and then the average price of the property being sold. This appears to have been reversed in the December 2018 quarter, and it is hopeful that the trend continues. Settlement costs and transfer fees. Before making a decision on whether to sell your property, buy another property, or hold your property, you should weigh up all of those factors. In our view, the property market in WA will lead the other property markets over the next few years. We have stronger economic growth prospects driven by an increase in mining and resource activity, which is likely to continue. It is unlikely that we will have the boom that we had in 2011 and 2012, and the only inhibitor to growth will be the level of population influx to assist to drive demand. 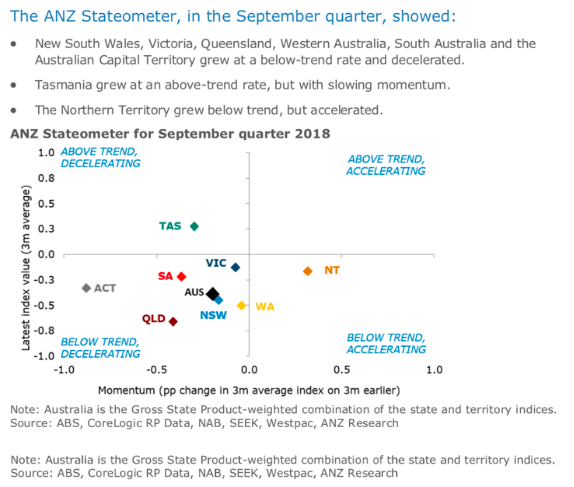 WA worst performing state, NSW already starting to decline. 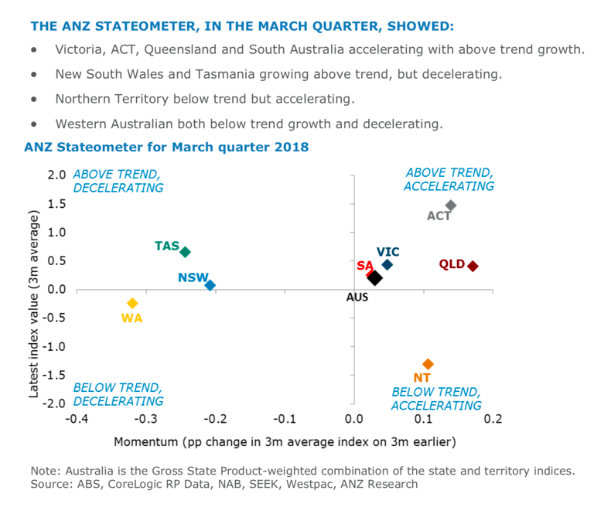 Victoria and NSW drop along with Qld, while WA is improving. 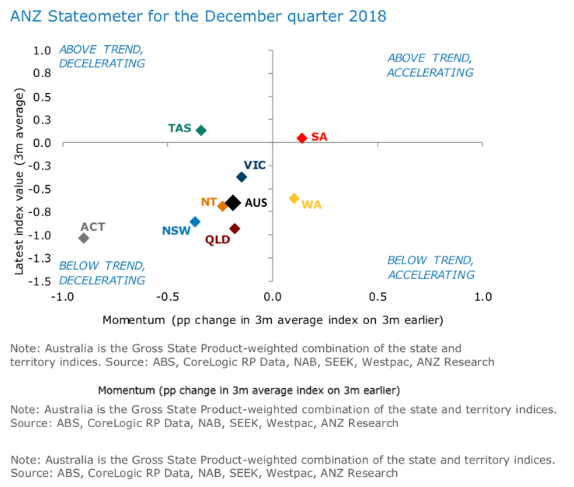 WA starting to improve and catch up to SA as the leading property state. Information in this publication is accurate as at the date of writing, 19 March 2019. Some of the information may have been provided to us by third parties. Whilst it is believed the information is accurate and reliable, the accuracy of that information is not guaranteed in any way. Property Exchange Australia (PEXA) is currently Australia’s only online property document exchange platform. It assists members – such as lawyers, settlement agents and financial institutions – to lodge documents with Land Registries and complete financial settlements electronically. Buying: the Lodgement of Documents takes place instantly, with the change of ownership expected to be confirmed by the close of business on the day of Settlement. 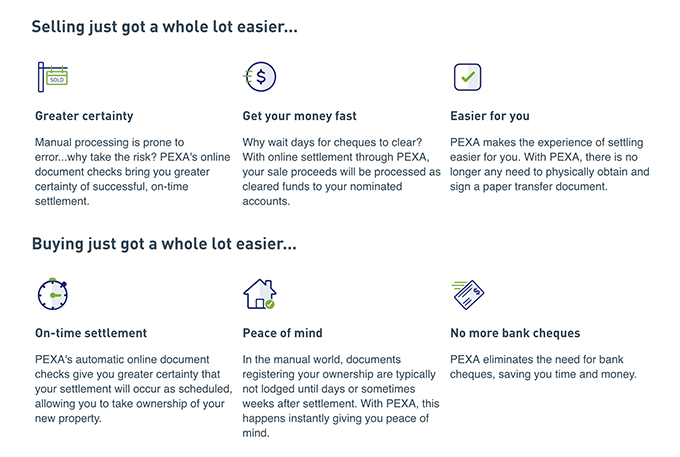 Selling: PEXA sends the Surplus funds directly to the seller’s nominated bank account, and these funds are cleared within 24 hours. Master Settlements is a part of AustAsia Group, with Syd Chesson being our licensee. Master Settlements undertakes all of the real estate and business settlements activities for our clients. The AAG team members from the property and finance team of the business help us with the settlements so that we have an integrated approach. or (08) 9227 6300 for all of your settlement and real estate buying, selling, management &/or development needs. Our team has more than 100 years’ combined industry experience and looks forward to providing you with friendly and professional service. Please click on the link below for more information about the services offered by AAG and the properties we are currently marketing for sale and rent. This publication has been prepared by AustAsia Group including Master Settlements (Triennial Certificate No. TC390), AustAsia Real Estate Pty Ltd (REBA Licence No. RA1736) and AustAsia Finance Brokers Pty Ltd, Australian Credit Licence No. 385068. Information in this publication is accurate as at the date of writing, 1 March 2019. Some of the information may have been provided to us by third parties. Whilst it is believed the information is accurate and reliable, the accuracy of that information is not guaranteed in any way. Do we help with a home deposit? “Should we help our children into their first home?” It’s a topical question in these days of shrinking home affordability but like most big issues, there is no simple answer. As a general principle, I find it’s better to assist your children financially sooner rather than later. After all, if you are 55 now, your kids are probably about 30, and it makes little sense to put off helping them until you are in your 90’s, and they are past retirement age. But first you need to understand why your children are unable to buy a home right now without help. Is it because they have not been able to save a deposit or because their income is insufficient to make mortgage payments, or a combination of both? This is an important issue because the last thing you want to do is help your children into a situation where they become financially over-committed. If they’ve been unable to save a deposit, is it simply because their incomes, combined with rent, make it impossible to save, or are they the type of people who are bad money managers and think nothing of spending big on a night out? If bad money management is the problem your first task should be to sit down with them, help them to set some goals, and suggest you revisit assistance when they have demonstrated the capacity to save. But if rent is the main issue, the best way for you to help may be to invite them back home and give them a couple of years of rent-free accommodation, on the condition all the money they are now paying in rent be saved in a special account earmarked for a house deposit. This could easily amount to $50,000 in two years. If their incomes are fine but insufficient deposit is the problem, and you’re satisfied that they will take a responsible attitude to borrowing, an option may be to go co-borrower. The effect of this is that your house will also be mortgaged as security for the loan. It will give them ample security and save them up to $30,000 in mortgage insurance premiums. The downside is that your home is available to the bank if your children default on the loan and house prices plunge. An option, if you opt for the above strategy, may be for your children to move out of the new home after living in it for a few months and spend a couple of years back with you. The house could then be rented for up to six years without capital gains tax being an issue, and the rental combined with the tax concessions should enable them to pay the loan down more quickly. Unfortunately, parents often put their names on the title deed as well as their children, as an alternative to going co-borrowers. That is a very bad strategy because the parents are still liable if things go wrong, and they could also face a hefty capital gains tax bill if they decide to transfer their share of the property to their children in the future. Another option includes simply gifting the deposit, provided your children are responsible money managers, but you need to keep in mind that your money may well have to fund your retirement until age 90 or beyond. It really gets down to balancing priorities. Just keep in mind the best strategy of all is to teach your children good money habits from an early age. This publication has been prepared by AustAsia Group, including AustAsia Financial Planning Pty Ltd AFSL License No 229454 and AustAsia Finance Brokers Pty Ltd, Australian Credit Licence No 385068. “Don’t sail out farther than you can row back.” This Danish saying is sound advice for anyone thinking of borrowing to buy a home, particularly now while interest rates are low but are likely to rise over coming years. According to a paper1 prepared by the Centre of Policy Development and University of Canberra, Australians have a tendency to be over-confident in our ability to repay loans. We also underestimate the likelihood of things potentially going wrong in our lives. Like most things in life, it’s difficult to make borrowing a stress-free exercise, but there are a number of things you can do to reduce the angst. Don’t borrow the maximum amount – Most financial institutions determine the maximum loan they will provide based on a multiple of your income and other factors. But if you borrow the maximum amount, you may find you are stretched from day one unless you are very disciplined with your budgeting. Build up a buffer – It’s a good idea to hold (or build up) a cash reserve in a mortgage offset account to provide a buffer that can be drawn upon to meet your loan repayments if you become ill or are off work for other reasons. Take out mortgage protection insurance – Many lenders offer insurance when you take out a home loan that covers the mortgage (often up to a specified amount and for a particular period of time) if you die, become disabled or your employment ends involuntarily. Fix the interest rate – Fixing the interest rate on your home loan can provide protection against rising interest rates. The downside is there are often restrictions on making additional payments into a fixed rate loan, which would limit your capacity to build up a buffer. Many people find a combination of fixed and variable rate loans works best, as additional repayments can be made into the variable rate portion of the debt. Don’t add fuel to the fire – Over 40% of the people who completed the RMIT survey responded to the initial difficulty in meeting mortgage repayments by using credit cards more often than they normally would. Using debt to service debt is very likely to compound the problem. Seek advice – At the first sign of a problem, it’s essential to seek financial advice, as there may be a range of potentially viable options to explore. Better still, you may want to seek financial advice before you decide how much to borrow. An adviser can help you assess your budget and determine your affordability level. They can help you to focus on other goals you may want to achieve in the short, medium and long term and the cash flow that may be required to meet them. They can also assess your insurance needs and advise you on a range of other financial matters. 1 Understanding human behaviour in financial decision making: Some insights from behavioural economics. Paper to accompany presentation to No Interest Loans Scheme Conference “Dignity in a Downturn” June 2009. Ian McAuley, Centre for Policy Development and University of Canberra. 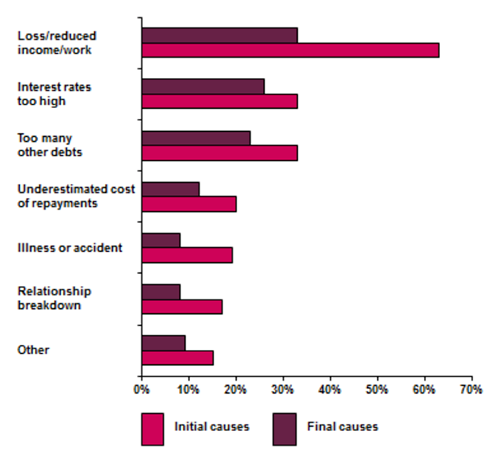 2 Mortgage default in Australia: nature, causes and social and economic Impacts. Authored by Mike Berry, Tony Dalton and Anitra Nelson for the Australian Housing and Urban Research Institute, RMIT Research Centre, March 2010. This publication has been prepared by AustAsia Group, including AustAsia Finance Brokers Pty Ltd, Australian Credit Licence No 385068.